Lowell's 11-game winning streak was stalled on Sunday and James Dunne has the story in Monday's Cup of Coffee. Rafael Devers returned from the disabled list on Saturday and Bobby Poyner was sent to Triple-A to make room for him. Poyner was activated on Sunday and Trevor Kelley was demoted to Portland as the corresponding move. Josh D. Smith was also added to Pawtucket on a paper move as Mike Olt went to the disabled list with abdominal inflammation. On Friday, the team signed Mark Montgomery to a minor-league deal. The 27-year-old right-hander had a 1.98 ERA in 13 2/3 innings for Triple-A Toldeo in the Detroit Tigers system. He was originally an 11th-round pick by the New York Yankees in 2011. The Boston Globe's Chad Finn wrote about the state of the system with regard to a potential trade Saturday, asking whether the big club even needs to make a move at the trade deadline. Jon Heyman of Fancred reported on Sunday that, in non-trade deadline reinforcements, free agent outfielder Austin Jackson could become an option. Jackson was traded from San Francisco to Texas on July 8 and the Rangers released the 31-year-old six days later. He's slashed .242/.309/.295 in 149 at-bats this year. The Boston Herald's Steve Buckley wrote a Friday column about how keeping Rafael Devers is the right move for the Red Sox. In order to acquire a front-line starter or a quality reliever, there have been reports that Devers may have to be involved. Denyi Reyes (pictured, left) is pitching well in Greenville this year, with a tiny 0.88 WHIP. WEEI's Vincent Gallo profiled the 21-year-old on Friday. 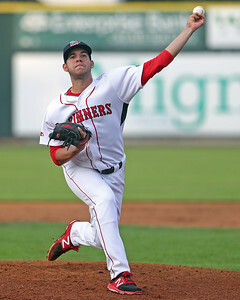 His coworker, Ryan Hannable, discussed SoxProspects' No. 2 prospect Bryan Mata and his high walk numbers, saying that they are not as concerning as you think. Bill Ballou of the Worcester Telegram and Gazette wrote on Sunday that a draft lottery could aid in preventing tanking, as the Orioles and Royals push toward 100-loss seasons. Midseason prospect rankings updates continued, as Baseball America released their top-10 Red Sox list. Matthew Gorst was promoted to Portland on June 22 and after a month, he has gone a long way to helping the Sea Dogs' bullpen improve, writes Kevin Thomas of the Portland Press-Herald. The SoxProspects.com donations drive is still pressing onward, going through August 10. Please consider a donation if you can, so that we can keep the site free and give the same great content that we have been for the last 15 years. Bobby Dalbec's two-week reign as player of the week is over as Juan Carlos Abreu had a torrid week. The 21-year-old is spending his third season in Fort Myers and has really improved, as he's slashing .329/.389/.476 in 2018. He's decreased his strikeout rate from 30.2 percent in 2017 to 20 percent this year. He was drafted by the Red Sox in 2016 as their 23rd-round pick out of Winter Springs High School in Florida. Enmanuel De Jesus (pictured, right) turned in the start of the season for Greenville on Thursday. He pitched 7 2/3 no-hit innings, retiring the first 22 batters he faced. After a strikeout to get the second out of the eighth, a pair of throwing errors allowed an Asheville runner, who was hit by a pitch, to score from second base and that would be the end of his outing, but the 21-year-old dominated. 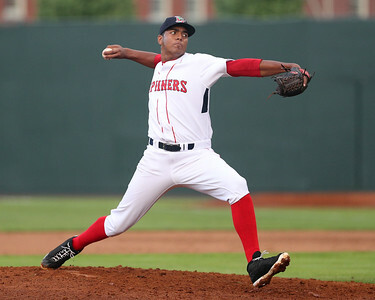 Originally from Venezuela, De Jesus has spent much of the season in Greenville and after bouncing between the Drive and Lowell in 2016 and 2017, has spent some time up in Salem this year. He hasn't allowed solid contact, surrendering just 22 extra-base hits in 66 2/3 innings in Greenville in 2018.